It all started on a boat in the Chesapeake when a DC chef asked me, “Have you been to Cathal Armstrong‘s restaurants?” I’d been living in the DC area a few months and my food writing career had been focused mostly on my comfort zone of agriculture stories. I could barely feign to be some sort of local restaurant connoisseur at this point, since we’d ratcheted on a stiff eating-out budget when we moved to high-dollar city. I answered with a sheepish, “I’m not sure. What are his restaurants?” and then braced myself to take notes. Apparently, this was something someone who lived in Alexandria, and frequented its Old Town strip, should know about. I should have known that when a chef around here comes recommended by another chef, it’s gonna be good. I started off my discovery of four of Armstrong’s widely varied Alexandria eateries (there are even more) slowly, and with the one that is newest and closest to my house. Society Fair celebrated its first anniversary last month as a fairly new concept to the Armstrong family: a coffee shop/bakery/market/tasting and dining room, with brilliant decor, white tiled floors, plush booths and endless kitchen goodies begging you to look around for a while. Not to mention the cappuccinos, which got true Italian Domenica Marchietti‘s seal of approval when I first met her there. Society Fair is in and of itself a picture of the restaurateur behind it — versatile and multi-faceted. Society Fair’s Justin tells me the place was started in part to meet the demand among customers for “the bread that’s served at Restaurant Eve,” Armstrong’s flagship establishment. They sell that bread, along with a vast selection of irresistible baked goods and hand-picked cheeses and rare cuts of butchered meats in the bit-of-everything shop. 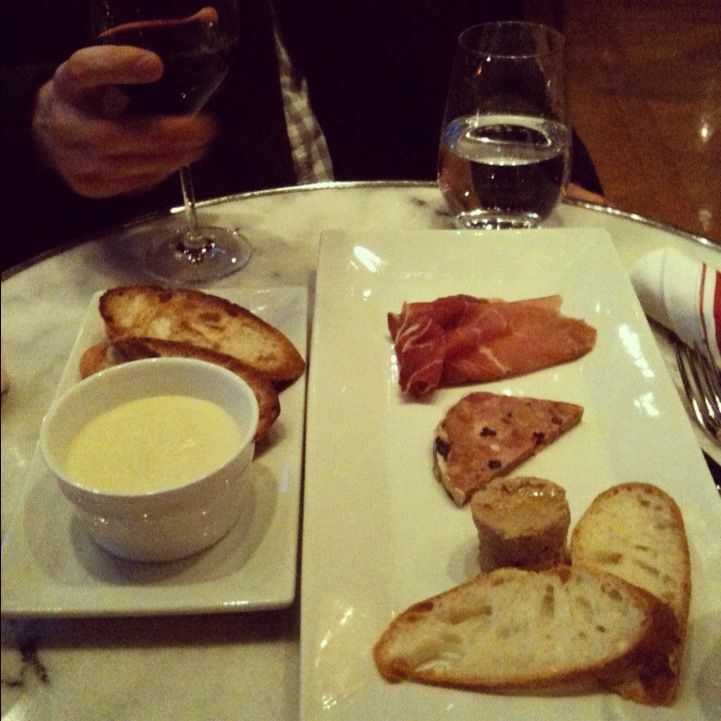 It feels like a French charcuterie/boulangerie/café all in one. I often meet there with friends for lunch, which includes a selection of perfectly balanced sandwiches. Then I peruse the little market, which sells (at boutique prices) everything from Polyface eggs to a take-and-bake cassoulet. 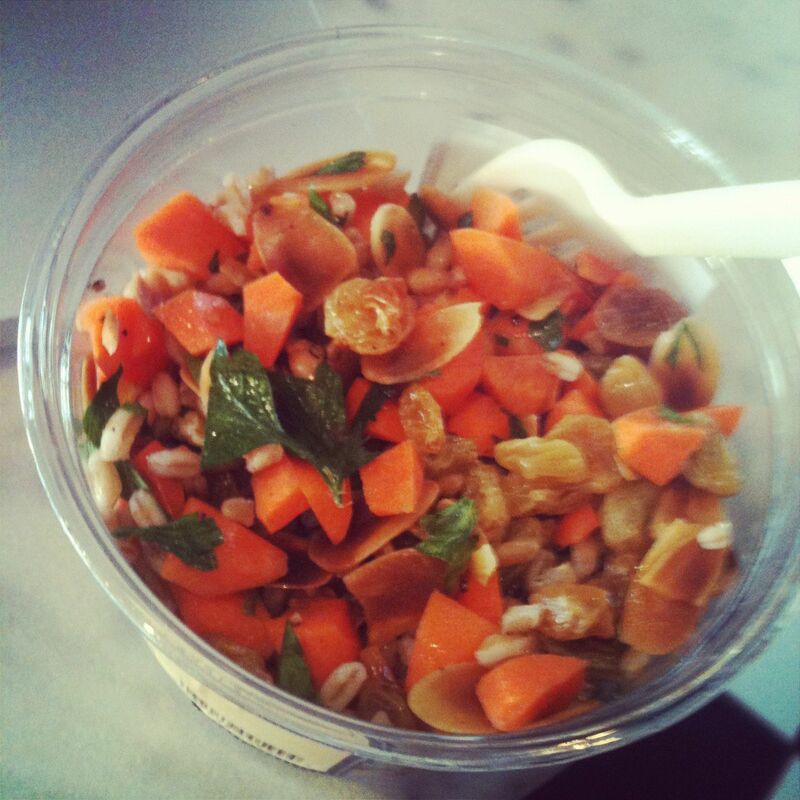 One of my favorites is this farro salad below, which I’ve tried to replicate at home. Beyond that, the Fair is a great place to get gifts and rare spices for the foodie in your life (my husband picked up the hints I’d been dropping and did so himself this year). 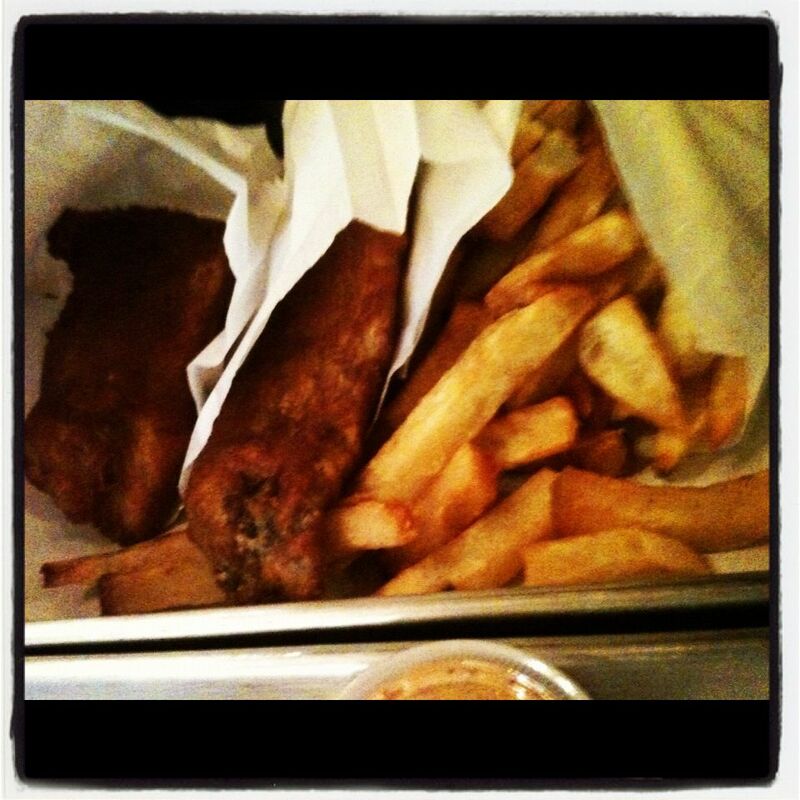 Which brings me to my next Armstrong discovery: his very budget friendly Dublin chipper (fish-and-chips) eatery in a tiny building off King Street, Eamonn’s. (He opened a second Eammon’s about six months ago in Arlington.) If you’re ever just visiting DC or Alexandria and famished-yet-cash-strapped after a long day of touristing and shopping, this is the place. We slipped in after a chilly but wonderful night of Christmas shopping at one of Alexandria’s new antique and consignment stores, the Bucket List (we cleaned up there, with retro coffee makers and paper cutters for family and friends). The fish was not what I expected, but oh so good. It came in one big hunk instead of the several smaller, heavily-breaded pieces we’re used to from, say, a childhood at Long John Silver’s. (That could be because Armstrong is actually from Dublin.) You could actually taste the flaky white fish, and I loved experimenting with the sauces that you get to pick with your order. Old Bay was delicious. Add french fries and a beer (to split), and you’re in for a toes-warming meal fit for any wintry night. The seating is limited so I suspect it gets quite jammed on the weekends. Consider taking this paper-wrapped treat to go. It took me a while to make it to the other, higher-priced places in Armstrong’s restaurant family. I had, of course, been eyeing an occasion to try Restaurant Eve, the critically acclaimed and utterly swanky dining establishment, hidden down an alley way sort of entrance not far from King Street. But $200 dinners are not an everyday occasion. But I found an affordable opportunity in Eve’s $15 Lickety Split weekday lunches, one of which I shared with my friend, cooking buff and caterer, Kathy. We got the sense from our little taste of Eve that, if they put as much care into their dining experience as they do in these lunches, it’s worth every penny. While the lunch was served at the comfortable bar, we got the chance to peek at the dining room that would be busy that evening. The cozy dining room feels like you’ve stumbled upon an enchanted cottage-in-the-woods, with an excellent decorator. The Lickety Split lunch includes any two choices from a list of either drinks, entrees or desserts. So you can get a drink and entree, entree and dessert or — as we both chose — two entrees. 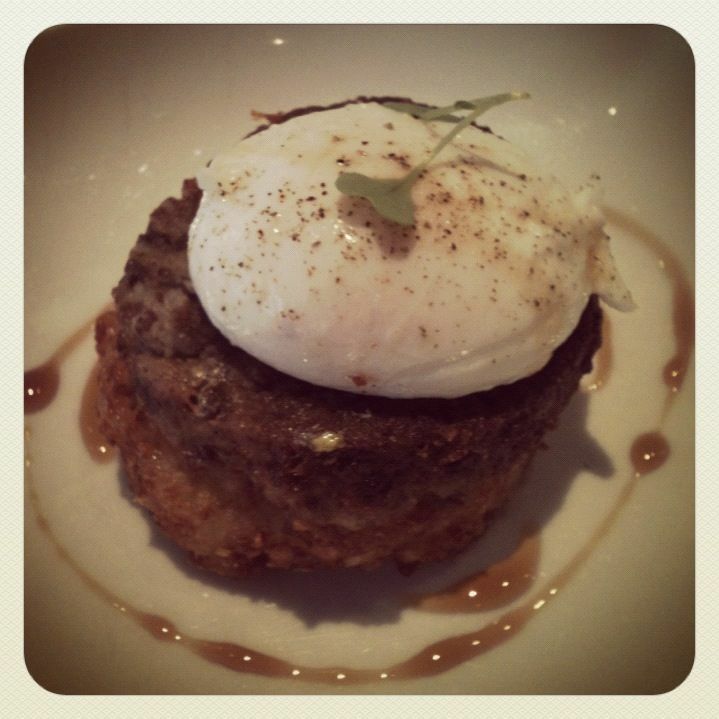 The antelope (that’s right, antelope) scrapple on potato cake, topped with a poached egg and drizzled with maple syrup was my first choice. The server told me the antelope pieces came from a farm in Texas and were worked into this working man’s breakfast dish, typically a compilation of various meats. My vegetarian lunchmate was not as enthralled with it. 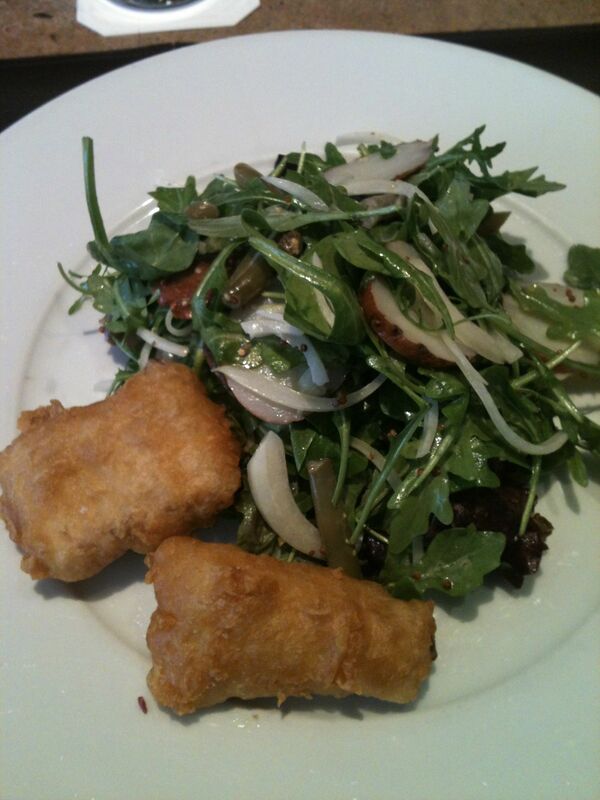 I also had the rockfish salad, below, that was a special that day. And last week, I reached the finish line of trying all of Armstrong’s Alexandria eateries — and then I crossed it again. I brought a new-t0-town friend to The Majestic for lunch on Saturday… and then brought more friends there for a birthday get together (yes, I’m getting older this week) on Monday. I nearly ordered the same thing twice, despite the array of choices on the menu. 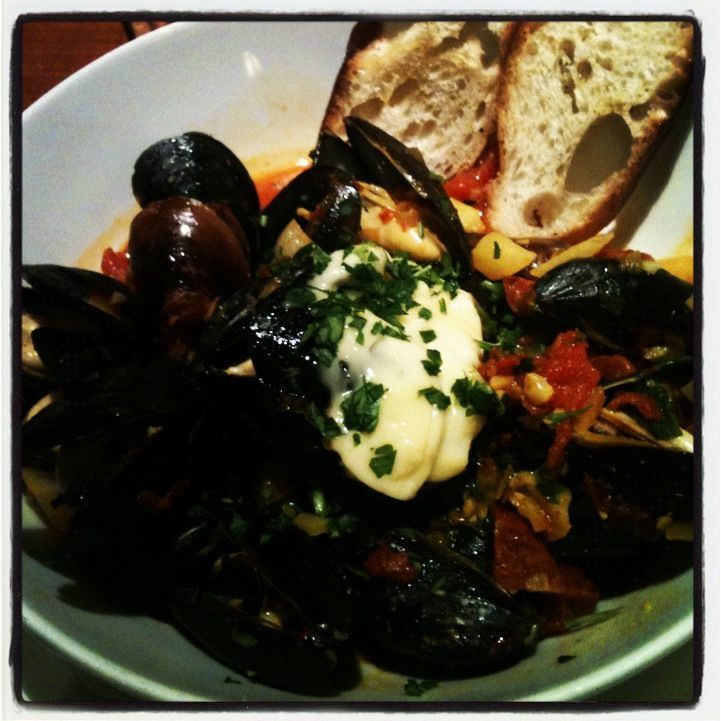 These saffron-infused mussels with chorizo were just that good. I highly suggest it on these wintry days. And don’t be ashamed to dip your bread in into the buttery, spiced sauce, or to pick up the bowl and drink it. I came pretty close. On Monday, I ordered a chicken confit salad special, just to change things up. Who knew chicken could get so delightfully duck-like when prepared like its birdy friend? 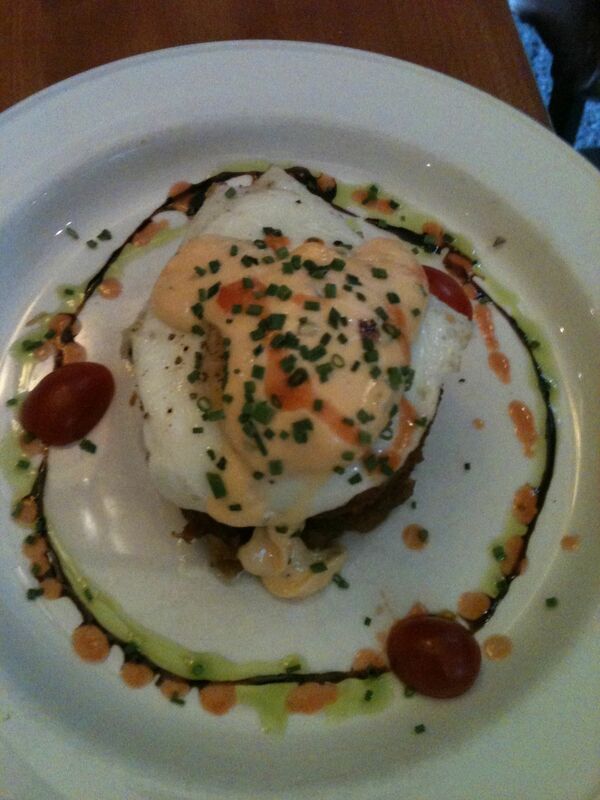 And my friend Kathy made a good choice with this breakfast-for-lunch beauty at Majestic. I couldn’t resist a photo. I’ve loved trying these restaurants, learning a bit about the chef behind them like a curious tourist instead of a journalist (no, I haven’t met him). And perhaps the best part is that I was able to try them all for lunch or happy hour or snack time, getting a taste of the chefs’ handiwork without breaking the bank all at once. I do hope to venture back for some evening dinners, but there will certainly be many more lunches and lounges between now and then. For friends who are visiting the area soon or who live here, I recommend any of these places, each with their own flavor, price point and feel. None of them are participating in the DC or Alexandria restaurant weeks that are ongoing, but they have their share of ongoing specials that make them very doable. Whitney, what a lovely lovely lovely blog post! I feel the same way about Restaurant Eve as a enchanted cottage, it’s so beautiful there. Wait until the springtime when our garden is blooming! Thank you for touring Society Fair (I’m almost always there), Restaurant Eve, and Eamonn’s (it’s all about the Kitty O’Shea sauce), and thank you for your tweets at Society Fair (I’m the one you’re always talking to). I will definitely retweet and share this wonderful post. Thanks again, and let us know when you’re stopping by the Fair, would love to meet you! I look forward to a future post when you visit our other establishments – PX, TNT Bar, Virtue Feed & Grain.